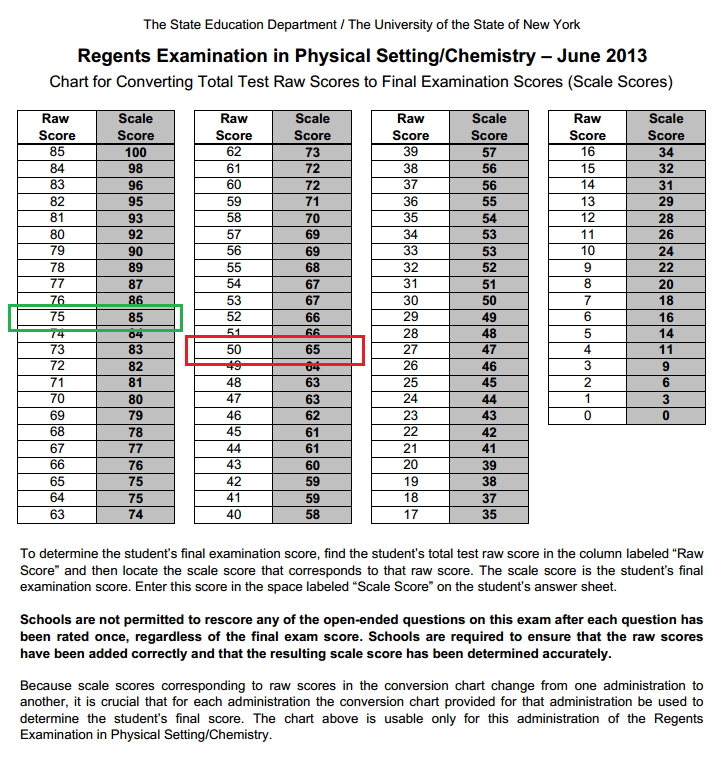 The total test raw score is converted to a scaled score using a conversion chart – that is specific to each exam. The June 2013 conversion chart is shown below, scoring 50/85 (59%) scales to a 65%, while 75/85 (88%) scales to a 85%. The math is correct – you need to score 88% to achieve an 85% in the New York State Chemistry Regents Exam! Questions in the exam are content and skills based and may require students to graph data, complete a data table, label or draw diagrams, design experiments, make calculations, or write a short or extended responses. In addition, questions may require students to hypothesize, interpret, analyze, evaluate data, or apply their scientific knowledge and skills to real-world situations. Some of the questions will require the 2011 edition of the Reference Tables for Physical Setting/Chemistry (6.18.2014). Critical understanding science concepts is the use of scientific inquiry to develop explanations of natural phenomena. Therefore as a prerequisite for admission to the written portion of the exam (and the performance test – Part D when added) of the Regents examination in Physical Setting/Chemistry, students must have successfully completed a minimum of 1200 minutes of hands-on laboratory experience with satisfactory reports on file.